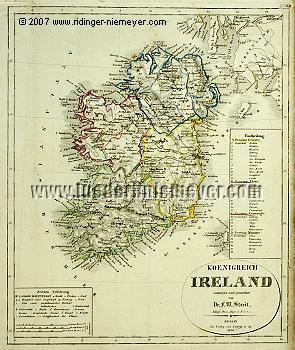 (Ireland, Kingdom of.) With title-cartouches and notes in two further. Map of the kingdom by Friedrich Wilhelm Streit (Ronneburg, Thuringia, 1772 – Berlin 1839). Steel engraving colored in outline. 1836. 11⅜ × 9¾ in (29 × 24.7 cm). With road net and local details. – Not absolutely fresh. A slight tidemark top left. – Still with Edinburgh.